The head of Big Tex weighs around 1000 lbs. and is about 2 feet taller (from chin to top of the hat) then the previous version. 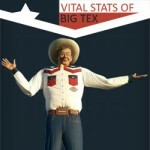 Big Tex grew a bit to 55 feet tall. That is about half the size of the Statue of Liberty (111 ft, 6 in). Big Tex packed a couple of pounds. He previously weighed about 6,000 lbs, but now weighs over 25,000 lbs.